Two years of preparation, 16 days of expedition and 7 hours and 40 minutes straight passed underwater by a single diver in one dive … A real expedition, a dangerous adventure that requires a high level of professionalism and advanced equipment. Where, when and how does it happen? 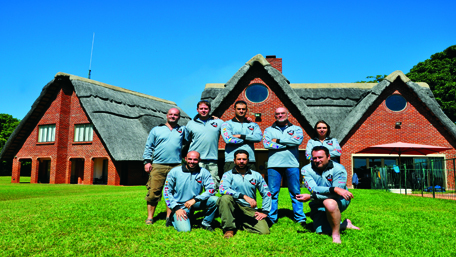 Prestige takes you to Zimbabwe to discover the mystery of Chinhoyi, place of this in-depth exploration that goes beyond the limit reached so far by a human being, and live an exciting and unique adventure in the company of a team of 8 international divers, including 3 senior Lebanese. The Canadian Glenn Campbell, the project proponent had already done it ten years ago, dives into the abyss of Chinhoyi and dreamed of continuing his exploration. Lebanese Simon Nadim, Primary Push Diver of the team, managed a 191m dive in the waters of the mysterious abyss where no man has yet reached. The gulf of Chinhoyi, located 135km or two hours drive from Harare, Zimbabwe’s capital, is a place for cult, sacred, full of mythical legends and mysteries with a magical power for the inhabitants. For millennia, the indigenous made offerings, pottery and other objects, and there threw their dead wrapped in white shrouds. Voodoo ceremonies are always held. At 1200m, the gap forms a huge hole filled with fresh water at the heart of the mountain. At the bottom of the abyss, under 85m, the huge entrance of an unexplored cave. Where this cave leads, what is its depth, geology and topography? These were the objectives and challenges facing the team that explored the place to try to pierce the mystery … The project logistically very complicated, required exceptional safety procedures that suit this kind of adventure. The story tells that the cave was used by an outlaw, Nyamakwere, who killed people and threw them into the abyss. Traditionally the pit of Chinhoyi was called Chirorodziva or cave that housed the people that were thrown. Later, a man named Chinhoyi, kills and gets rid of the population of Nyamakwere and becomes head of the Mashona tribe. 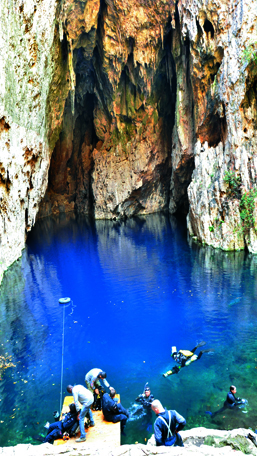 Since then, the region that also includes several limestone caves, bore the name of Chinhoyi in recognition of its benefit. These caves were used as shelter to Chinhoyi and his supporters against attacks of the Matabele tribes. These caves and pit were discovered by chance in 1887 by a major European hunter Fredrick Courtney Selous. The region, which was initially declared National Monument in 1957 became National Park. 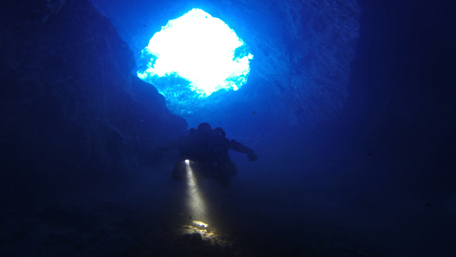 The waters of the cave are clear blue reflecting deepness, where the temperature does not fall below 22oC. More than three tons of material and advanced equipment were sent from Beirut, Dubai and South Africa to Zimbabwe’s capital, Harare. And transport of material was made by 4×4 to Chinhoyi, which is about two hours drive from Harare. Then transport to the cave becomes difficult and impractical given the steep trail. 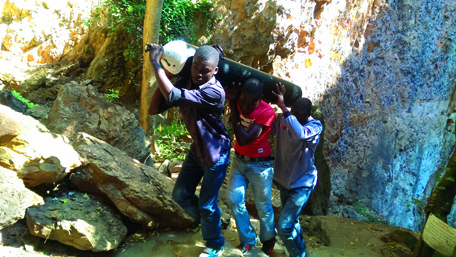 Holders ensured carrying all the equipment by walking to the entrance of the cave. Standing on the platform, Ronald Rizk, Simon Nadim and Samer Issa, the three Lebanese of the team proudly waving the flag of their country. Samer Issa, photographed by Ronald Rizk with camera Hero 3 Black Edition Go Pro. The team is finally ready to run the dive plan. Indeed, each member has a specific mission. At each depth, a diver had a function and instructions to be followed. It is 11 hours 56 minutes in the morning, the adventure begins. The gulf is as a sinkhole which descends to 85m. Here, divers discovered the entrance to the cave of 50m tall and 100m wide. Glenn and Simon engage in the cave. A little further down, the darkness is total, because beyond 100m you cannot see anything. Glenn and Simon continue their dive where no human being has yet succeeded. They want to know if the cave will expand or become closer or will it arrive at the entrance to a second cave? Arrived at 160m depth, Glenn stops at this area to explore it. Simon continues alone an in-depth exploration, its purpose is to determine the depth and breadth of the cave. All studies and forecasts showed that the cave would not exceed 171m deep. To everyone’s surprise, Simon reached 191m deep, making a horizontal penetration of about 200m. After 8 minutes at this extreme depth, every second becomes important and each movement valuable. Return to the surface was required. To reassemble, Simon had to make several stops bearings which are vital. He began his bearings from 120m, and then every 3 meters, because the more in depth he is, the more he must make a greater number of levels. A rapid change in pressure can be dangerous and cause bubbles that may cause serious problems such as paralysis. When Simon comes to the surface, it is 7 hours and 37 minutes in the evening. This is the end of the dive that lasted 7 hours and 40 minutes straight, with 20 minutes spent more than 100m deep. The whole team is at his post. Everyone is aware of the importance of his role. All rejoice and worry at the same time. 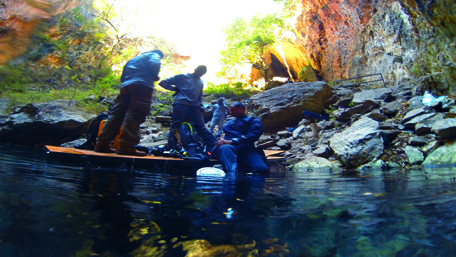 They are there to try to unravel the mystery of Chinhoyi, but it is also the most dangerous dive of the expedition. Simon Nadim is preparing to dive . He will return to the surface at 7:37 in the evening. At 30 meters deep, Simon Nadim is on the way back to the surface. He makes his decompression. He still has 5 hours and 30 minutes of decompression under water. The exploration has demonstrated that the cave is much deeper, unlike all previous studies. This is the first expedition that goes beyond the 110m depth and where man is ventured up to 200m. The collected data are stored and will be delivered to the Ministry of Tourism of Zimbabwe. The project has received the support of the police force in the country and the Zimbabwe National Park. The media have booked them a hero’s welcome. A new project is underway to explore another cave unknown to Lebanon. This is a very dangerous expedition that requires very sharp security measures, especially that the site is far from any infrastructure and the diving depth never reached. We had to be prepared for all contingencies. 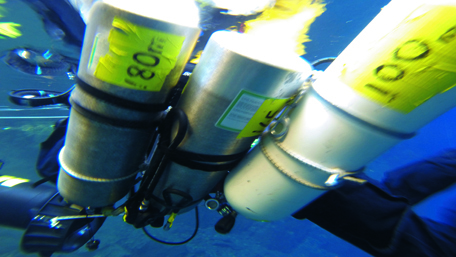 Simon Nadim has developed strategy and protocols of extreme decompression diving. Very advanced experimental technique, it has been applied by Simon and Glenn. Simon has developed this technique in conjunction with the deployment of the breadcrumb, while driving the scooter underwater. The rope deployed behind him, becomes a landmark and guides the plunger in his ascent. In dives of this kind, it is necessary and essential to make decompression levels. Otherwise, inert gas bubbles may form in the body and cause decompression sickness that causes pain or paralysis. 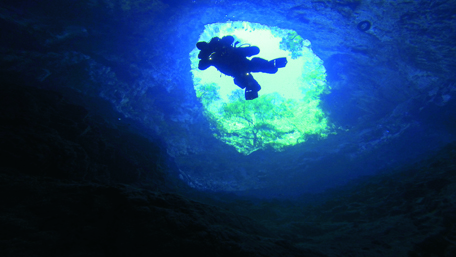 More diving is deeper, the number of levels of decompression increases. The challenge was to develop a strategy and logistics of decompression protocols emergency security, without knowing the exact depth to achieve maximum, which was estimated between 140 and 200m. In general, it is essential and vital to know the exact maximum depth to prepare for his dive plan. This technique is vital in case of an accident because there was no decompression chamber throughout the region. This is a technique developed by Glenn Campbell in collaboration with Divers Alert Network DAN and Infinity Clinic. It is intended, in case of decompression accident, to recompress the person to remove the inert gas bubble formed in the body. In practice, the operation proceeds as follows: we do carry the Full- Face Mask to the injured person who is plunged into the water to reduce the bubble in the body. Then, we proceed slowly to move up to the surface. The Full – Face Mask is used to communicate with the outside while underwater, using a radio. Even if the person faints, there is no risk of sinking and can still breathe. 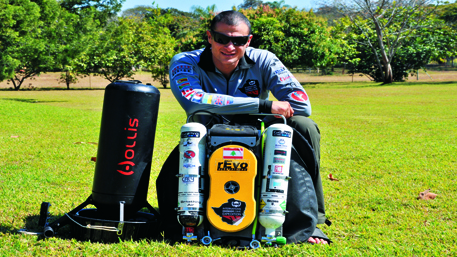 Simon Nadim, Primary Push Diver, was nicknamed Scuba Warrior by the authorities of the country after his successful dive. The team had at its disposal different types of recyclers. However, the one Simon used for the ultimate diving of 191m bears rEvo brand. The role of recycling is to recycle the air we breathe. In other words, the filter of carbon dioxide, CO2, and to compensate the oxygen used by the body. The recycler provides the ideal gas mixture for each depth. Simon was able, through this technology, to stay more than 7 hours underwater. In deep water, the lack of effort is recommended to avoid decompression sickness. Scooter Hollis is very useful in the depths and lets the person move freely underwater with a range between one and two hours. Simon was equipped with two scooters, one for the use of the diving and the second in reserve for more security. As the seconds are counted in extreme depth, underwater scooter allows you to move much faster than fining and explore a greater distance. The scooter is a useful material for a dive exploration. The team has provided more than 20 gas cylinders and an extra recycler available for emergency cases. The gas mixture was made by the team. For the shallower areas, the mixture is rich in oxygen. While special gas mixtures rich in helium and low in oxygen were provided to the deep part. The usefulness of this gas mixture is to avoid the diver nitrogen narcosis due to nitrogen. Beyond a certain pressure, the oxygen becomes toxic and may cause seizure. These satellite phones were provided by Xtra Link to enter into contact with DAN, Divers Alert Network, the international medical network in case of emergency during the dive. Go Pro has provided Hero 3 Black Edition cameras, necessary to film the expedition photos and videos for documentation, through its agent in Lebanon, Mike Sport. First National Bank FNB contributed partly to finance the expedition. More than twenty bottles of various gas mixtures suitable for each depth were planned for this expedition. The Canadian Glenn Campbell is at the origin of this expedition. He was twelve years old when he made his first dive. This experience enriched his imagination and shaped his life as an explorer and diver. Since 1992, Glenn makes numerous explorations of caves in Mexico, Florida, Central America and Africa. He knew well the site of Chinhoyi, having lived ten years on the African continent. Glenn has achieved 2,000 hours in CCR rebreather closed circuit, and 7000 dives in Canada and in the African lakes. He opened four dive schools in four countries and trained over a thousand divers. Directing Manager and Managing Partner at Coastal Technical Divers, the most important club of deep technical diving in recycler at UAE. • At the head of Pure Tech Diving Facility, established in 2004, the Lebanese Simon Nadim is a specialist in technical deep diving exploration and discovery and exploration of shipwrecks and caves. He was only twelve years old when he dived for the first time in the Caribbean Islands. And for twenty years, his passion for diving matures and endures. • Simon Nadim has participated in numerous expeditions in Lebanon and around the world, the most known are: the exploration of the wreck of HMS Victoria in Tripoli, at 145m, the exploration of the aircraft carrier HMS Hermes in Sri Lanka, at 50m deep, exploring the German submarine U533 in international waters between the UAE and Iran, at110m and caves in Florida. 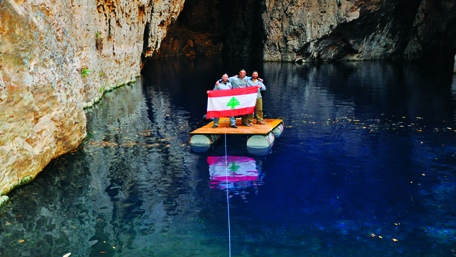 He is also the first diver to have explored a cave still kept secret in the Lebanese mountains. • Instructor Trainer (trainer of trainers) in deep diving, Simon is also monitor recyclers on rEvo and international member of prestigious organizations like TDI, IANTD NAUI and PADI. The British John Pike began diving at the age of 14 years at British Sub Aqua Club. He has participated in more than a thousand dives. In a short time, he managed to complete his race NormoxicTrimix and CCR cave race. He also performed with Glenn a reconnaissance trip to Chinhoyi to prepare the logistics of the dive. He led the logistics and was responsible with Thomas Moor of the safety of the divers in the deep part. The keeper of diving Tammy is originally from Zimbabwe. She dives since 13 years. She is the first woman in Malawi to qualify as a Malawi based Helium mixed gas diver, allowing her to earn the rank of Normoxictrimix in 2003. Divemaster, she served logistics coordination between countries. Craig Barnett comes from Zimbabwe. He started diving in 2007 in Singapore, and traveled to exotic places like Pulau Lang, TelokJawa,Reyners Rock and Dayang Reef. He also plunged into the Red Sea, Sharm el Sheikh, Sharks Bay and White Knight. Then he plunged into the Indian Ocean, and at Chinhoyi with the team. He played a central role in the coordination of logistics and formalities. He is the architect of the platform. Ten years of rich experience, the Lebanese Ronald Rizk recently became E -CCR diving. He traveled the world in search of diving challenges in unique places.Ronald helped provide a feeling of security to divers. He played a critical and vital role in supplying divers and ensured their safety during the dive. Samer Issa is Lebanese. He dives since eight years and is qualified to be the diving supervisor. He averaged 250 dives per year. He is qualified for both the rebreather and the Open circuit. He supports divers on gas blending and equipment maintenance. He was with Ronald, technical and security supervisor. He played a key role in the emergency protocol. The French Thomas Moor, great IT expert, dives a long time ago around the world. Recently he underwent intense training with Coastal Technical Divers in the United Arab Emirates and South East Asia. He was responsible for the safety of divers in the deep part.